Double Happiness is one of the many Chinese inspired slot machines available these days, and you’re going to find that pretty much every developer has one or more. Aristocrat is the developer behind Double Happiness, and they have done a decent job with it. The design is a pretty normal one, there is nothing truly special about it, but that’s not necessarily bad. 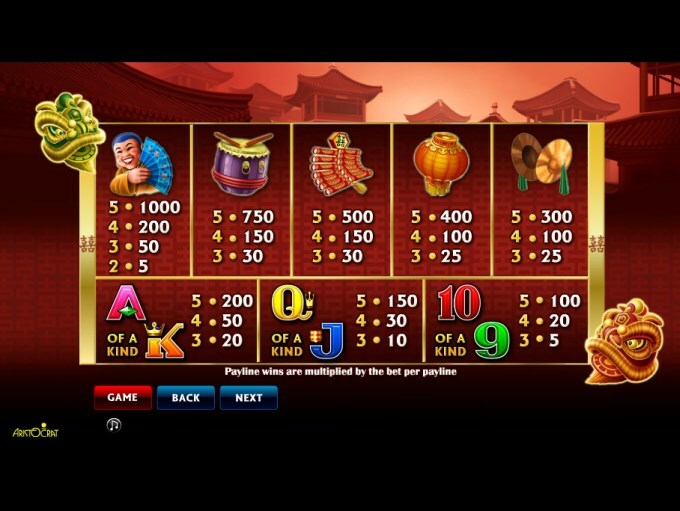 With 5 reels, Double Happiness offers a total of 25 bet lines. It also has free games with roaming wilds, scatter symbols and regular wilds. If you’re dreaming of its biggest prize, know that it will give you up to $5,000. 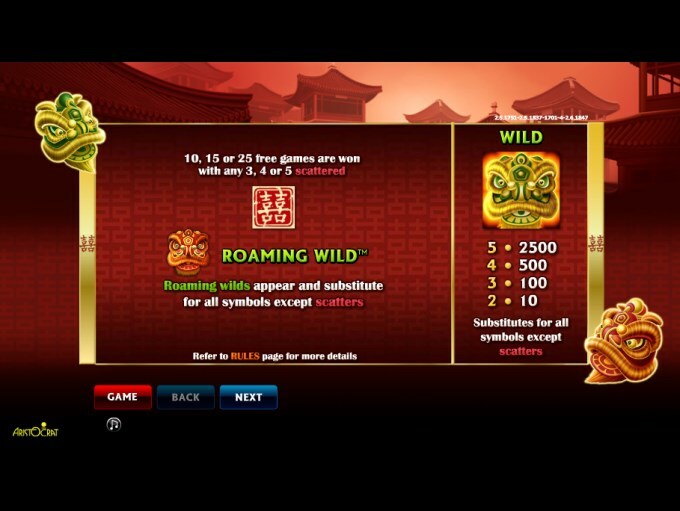 While there are some regular cool features in Double Happiness, meaning wilds, scatters and free spins, you will also find something that is far rarer, the chance to get roaming wilds during free games. You will get a Golden Dragon symbol at times, though not very often, and you will be happy when this happens, because it’s a wild feature. As a wild, it will mostly be useful as a substitute for regular icons, but it also creates combinations of two to five wilds when these symbols appear together on the same line. Payouts of up to 2,500x are offered this way, an amount which isn’t impressive considering what other slots will give you. Scatters are the only ones that can’t be replaced with a wild, all other symbols will take advantage of its presence. The Double Happiness Sign is the one with a red background and Chinese writing on it. This is the scatter symbol, and its name will tell you how it works. Having multiple scattered symbols of this type, in random locations on the reels, will trigger a prize and a free games feature. The prizes are offered when 3 to 5 Signs are scattered and they are worth between 5 and 100 times the round’s total wager. You get a number of free spins when multiple scattered Signs are on the reels, with 10 rounds for three symbols, 15 for four and 25 free spins for five. 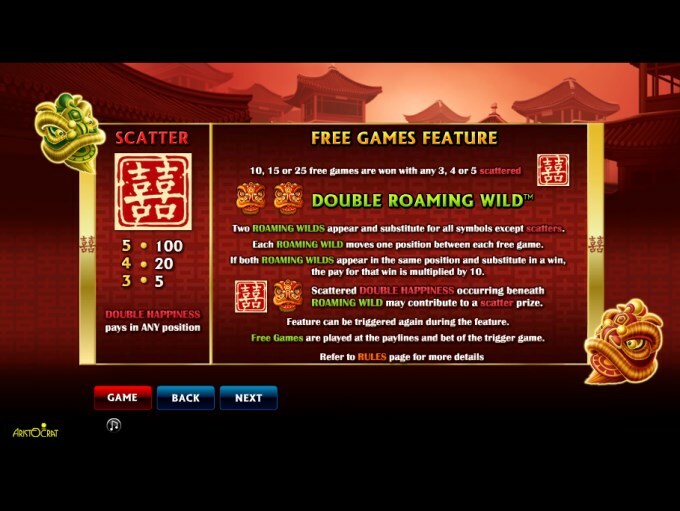 These free spins come with Double Roaming Wilds, the feature being the only original one that is offered. These Roaming wilds come in twos, so you have both present and substituting for other symbols. They will move by one position after each free spin. If both wilds show up in the exact same spot and they are part of a combo, the multiplier applied to the prize will be 10x. Betting uses an unusual system, where you use 30 coins to cover 25 lines, without it mentioning any extra bet that needs to be covered. Despite the use of 1.2 coins per line, only 1 coin is used as a basis for the prizes, when multipliers are applied. The value of the 30 coins is between $0.01 and $2 for each one, so you have maximum bets of $60. You get up to 2,500 coins when the jackpot is awarded, which means $5,000 at most. The scatter symbol does better, with its 100x the bet prize meaning $6,000 for you. 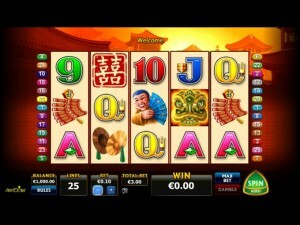 This being a Chinese themed slot, there are a couple of things about its design that will feel familiar. 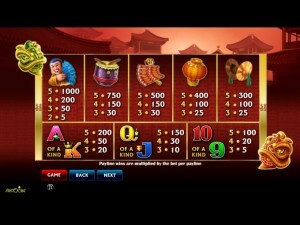 There are Chinese style roofs and buildings visible behind the game area, with the light yellow reels being occupied by poker cards and by objects with a distinct Asian influence. 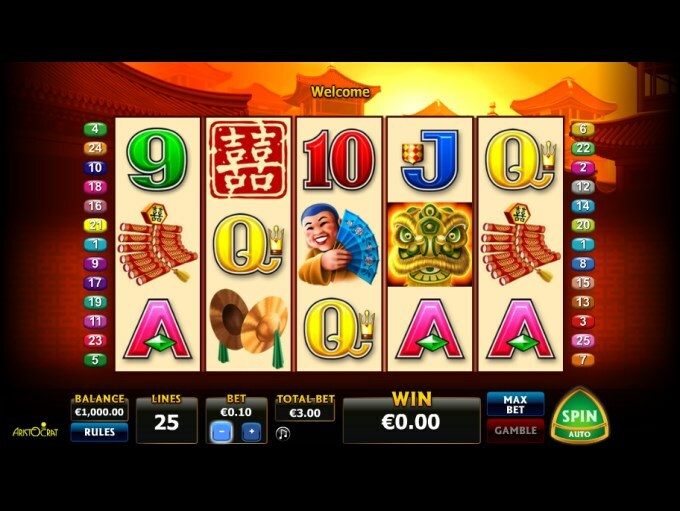 It’s a decent looking design, one that feels just as good as some of the best slot machines that have this theme. Symbols: Double Happiness Sign (100x the wager, scatter), Golden Dragon (wild, 2,500 coins), Chinese Lady (1,000 coins), Drum (750 coins), Firecrackers (500 coins), Paper Lantern (400 coins), Metal Discs (300 coins), Ace (200 coins), King (200 coins), Queen (150 coins), Jack (150 coins), 10 (100 coins) and 9 (100 coins). I’m a fan of the roaming wilds which appear once the free spins are in use, but the game does well enough in other areas as well. Overall, I’d say give it a shot, it might surprise you. 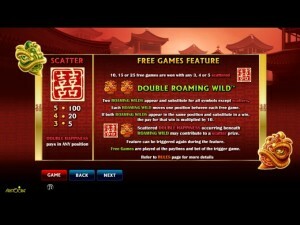 This Double Happiness slot is offered by all online casinos with Aristocrat software, playable either in practice or in real money mode.